God’s Word provides instruction about how teachers should view Bible teaching. Gain God’s perspective and you will make a difference in people’s lives. What we as Bible teachers tell ourselves makes a difference. We’ve already looked at how certain lines of thinking affect not only what we teach but also how we teach. When we hold to misconceptions containing only partial truth, we might weaken and negatively impact our teaching. We’re on the final post of a series looking at how the words of Jesus in Matthew 5:19 confront some of these misconceptions. Misconception #3: God will work in students’ lives in spite of us. Problem: This line of thinking assumes a compartmentalization between our lives and ministries. As along as we show up and teach well, how we live outside of class in our personal lives is our own business and doesn’t matter. God doesn’t need us to work in people’s heart. That’s His job. We just teach people what He says. God looks for and commends integrity and authenticity, an agreement between what we say and do. Jesus said, “but whoever practices and teaches these commands will be called great in the kingdom of heaven.” How we live outside of class does matter. Jesus supports our need for such authenticity when He goes on in verse 20 to talk about a righteousness that “surpasses that of the Pharisees and the teachers of the law”. Repeatedly throughout the gospels we read of Jesus confronting their hypocrisy in telling people to do one thing while doing another. 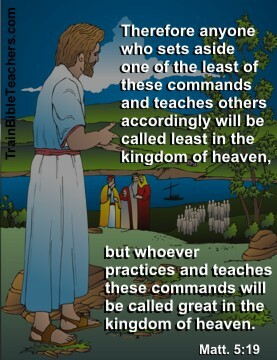 Jesus said that those who practice what they teach will be called great in His kingdom, letting us know where our true reward comes in teaching. Ultimately God is the One who brings the growth, but we work in cooperation with Him as we plant and water the seed (1 Cor. 3:6-9), reinforcing by our example what He wants people to know about Him. Yes, God can, and has, worked in spite of us to accomplish His purposes, but He desires, and rewards, our faithfulness. We’re in a series of posts with misconceptions containing partial truth, looking at how Jesus would correct it based on His teaching in Matthew 5:19. Here we want to focus on a line of thinking that might sound good but actually could negatively affect how we teach. Misconception #2: What really matters is that Bible teachers love Jesus. Problem: Too often we use this line of thinking as a rationalization for not adequately preparing. God knows our heart, we reason. Leaders might justify inadequate recruitment or training practices, saying anyone will do as long as they love Jesus. Jesus said, “ANYONE who sets aside one of the least of these commands and teaches others accordingly will be called least in the kingdom of heaven.” He doesn’t make exceptions. “Anyone” includes each and every one of us, no matter how much we love Jesus. We will not receive His commendation if how we teach invalidates His Word. We are all accountable to accurately communicate truth which takes diligence and conscientious study (2 Tim. 2:15). Busy people who love the Lord still need to rightly divide the Word. As part of a series on Misconceptions with Partial Truth, we’re examining some lines of thought Bible teachers might have that can affect what they teach, how they teach, and how they live. We’re looking at the truth in it, the problem or lack of truth, and how Jesus would correct it based on His words in Matthew 5:19. Misconception #1: We should teach the New Testament about Jesus and God’s grace. Problem: This agenda implies that we neglect the Old Testament, and the law, as no longer having relevance or usefulness. Truth: We do live under grace rather than the law (Rom. 6:14). 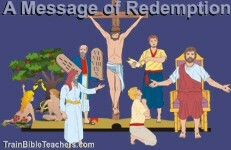 Jesus should have supremacy (Col. 1:18). But, ALL Scripture is God-breathed and useful (2 Tim. 3:16-17) which includes the Old Testament history, law, poetry, and prophecy. It lays the foundation, showing us why it was necessary for Jesus to come and die for us. The Old Testament provides evidence that Jesus really is the Messiah as He fulfilled prophecies therein. Jesus Himself said that Scripture, which would have been only Old Testament books when He lived on earth, testify of Him (Jn. 5:39). We lose a fuller understanding of Jesus when we set parts of the Bible aside. 1) Jesus did not minimize the law. Why should we? Do not think that I have come to abolish the Law or the Prophets; I have not come to abolish them but to fulfill them. For truly I tell you, until heaven and earth disappear, not the smallest letter, not the least stroke of a pen, will by any means disappear from the Law until everything is accomplished. Then Jesus goes on in verses 21-28 to give examples of how the fulfillment of the law went beyond where the teachers of that day took it. He put displaying anger toward someone and murder on the same level. He also likened looking lustfully at someone to adultery. Jesus elevated the law by emphasizing the heart and attitudes, not just actions. Yes, only Jesus could truly fulfill the law. And, when we put our trust in Him, His righteousness becomes ours. But, that doesn’t mean we neglect teaching that part of God’s Word. All Scripture lead us to Him, not away from Him, when properly taught. He said, “anyone who sets aside one of the least of these commands and teaches others accordingly will be called least in the kingdom of heaven.” The phrase “set aside” means loosing or rendering them as unbinding, much like the annulment of husband and wife. We’re laying it aside as unbinding or no longer relevant or valid. We shouldn’t be doing this in our own lives, but Jesus makes it clear that it’s especially grave when we teach others to do the same. We’re accountable to teach the whole counsel of God, not just the parts we perceive as important. We may have good intentions thinking we should teach the New Testament about Jesus and God’s grace. We should want to raise Jesus up as supreme but it’s only commendable when we do it the way He tells us to which is not to invalidate any part of His law (Matt. 5:19) but rather to view all Scripture as God-breathed and useful (2 Tim. 3:16-17). Having served as a Christian Education director in a church and also having talked with people at other churches and conferences in which I taught, I would hear certain assertions about teaching that had elements of truth within them but not fully true — misconceptions with partial truth. Yet, people would cling to the truth in it as justification for doing the part that wasn’t true. 1) We should teach the New Testament about Jesus and God’s grace. This could affect what we teach. 2) What really matters is that Bible teachers love Jesus. This could affect how we teach. 3) God will work in students’ lives in spite of us. This could affect how we live. On the surface, these conceptions might sound good but they’re not the whole truth. Jesus’ words in Matthew 5:19 help us identify the above thoughts as misconceptions with partial truth. He said, “Therefore anyone who sets aside one of the least of these commands and teaches others accordingly will be called least in the kingdom of heaven, but whoever practices and teaches these commands will be called great in the kingdom of heaven.” — In the next three posts we’ll look at the truth in each misconception, the problem or lack of truth within it, and how Jesus would correct it. You can subscribe to receive e-mail updates of new posts. A mixture of clay and iron lacks the same strength and durability of something consisting of all iron. A dichotomy results as the two don’t mix well together. People may go away with mixed messages, not quite sure what to believe. Or, they may buy into our same misconceptions resulting in less than optimal living of the Christian life. When we hold onto these conceptions with only partial truth, we might initially seem to be doing well. The effects may, however, show themselves over time as our foundation weakens due to the clay (mistruth) mixed in with the iron (truth). Whether we’re Bible teachers or ministry leaders recruiting teachers, we need to examine our teaching philosophy or belief systems to make sure they fully align with the truth of God’s Word.